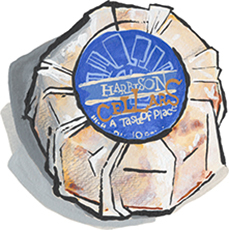 Harbison is a soft-ripened cheese from the acclaimed cheese makers at Jasper Hill in Vermont. It's a small wheel made from pasteurized cow's milk, wrapped in the inner bark of spruce trees. The bark holds the cheese together as it ages and imparts a woody, slightly piney flavor to the cheese inside. As it ages, the cheeses goes from being light and firm to ooey, gooey, and spoonable. Let it come to room temperature, cut off the top, scoop it out onto something warm and crusty, then sit back and let your eyes roll into the back of your head. It's that kind of an eating experience, an unforgettable introduction to how incredible soft-ripened cheeses can be.